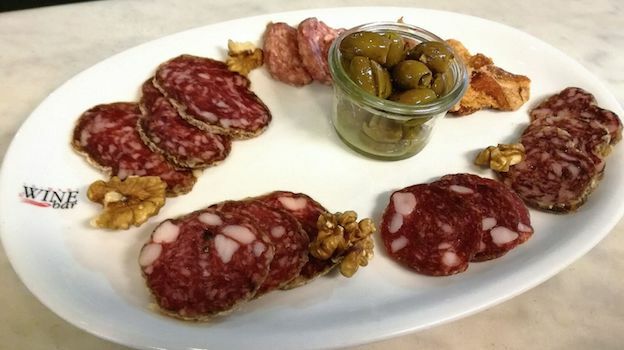 Still going strong after twenty-five years, Trimani Wine Bar has been, from the start, a bright and important addition to the Eternal City’s food and wine scene, which didn’t exactly shine when the place opened years ago. The wine-bar is also the ideal complement to what is Rome’s most famous and oldest wine shop, the Enoteca Trimani, which is just around the corner. Although the enoteca opened just before World War I, the Trimani family has been involved in wine for close to 200 years. The Trimanis started selling wine in the mid-19th century, first in via di Panico, then in via delle Carrozze and finally via Piave, not far from the present day location of both wine shop and wine-bar. Siblings Carla, Francesco, and Paolo have followed seamlessly in the footsteps of their father Marco, one of the first and few truly knowledgeable wine shop owners Rome could boast thirty years ago or so. Oft-quoted and interviewed for his knowledge on all things wine, Marco Trimani was an especially big promoter of the wines of Lazio, but at the wine shop you could also find wines from Burgundy and Bordeaux back when most Italian wine shop owners didn’t know what Château Leoville-Poyferré was, or that an Auslese was usually sweeter than a Spatlese (and I’m referring to the early 1980s, not prehistory: I lived through those years in Rome and it was honestly tough going). Today, it is still a family effort. Paolo and Francesco run the wine shop, while Carla manages the wine-bar. A fourth sibling, Giovanni, is an artist who often drops by for a drink. The wine-bar offers a selection of truly great wines from all over the world in all price ranges, and generally at only small markups, as they are sourced directly from the shop. Besides a ton of little known Italian producers, there are also famous names to choose from such as Leroy, Dagueneau, Raveneau, Rousseau, Kistler, Egon Muller, Deiss and more. 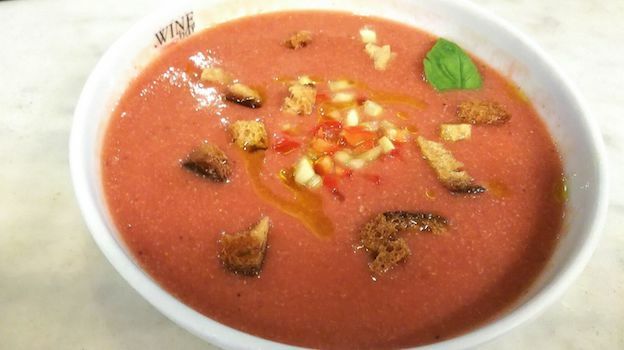 The wine-bar does simple things well, offering hearty concoctions and rustic aromas and flavors in a simple, almost spartan, but friendly setting. This is not a destination for gourmets looking for the latest foam or infusion; rather, it’s a heaven of solid dishes that accompany the great wines on offer. Be aware that some of the ingredients at Trimani are amongst the best in their respective categories in all of Rome. For example, don’t miss either the buffalo mozzarella from Paestum, should it have arrived on the day you drop by (ask the waiter), as it’s one of the four or five best you’ll taste anywhere in the city. Similarly, the filet of beef is also well above average. 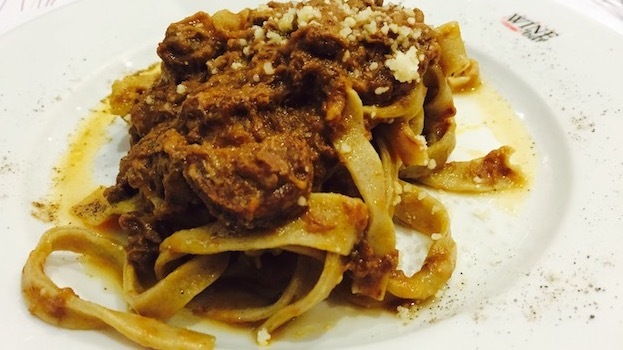 Flavorful and tender, the beef is also one of the best you’ll come across in Rome (the meat comes from a breeder in northern Lazio). Old standbys, like the curried chicken and basmati rice, or most pastas, are also flavorful and rarely disappointing. I also appreciate the food research that goes on here. For example, Timballo alla Bonifacio VIII, a distant (very distant) relative of lasagna, is made up of layers of tightly packed tagliolini, meatballs, tomato sauce, and more that was created in honor of Pope Bonifacio VIII. I always find the use of the word “historic” in relation to food to be especially noteworthy. 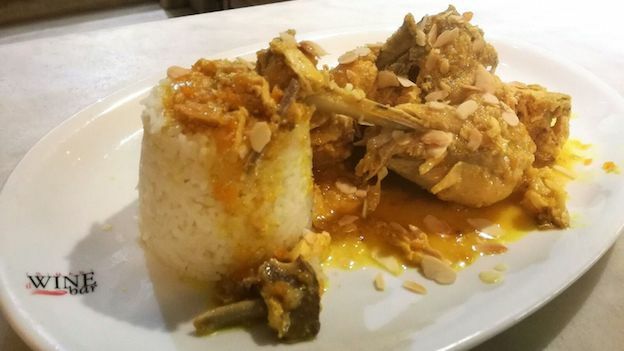 Interestingly, this is a dish that is quite obviously either an update of an original recipe, or one that must have been created centuries after the Pope’s life. Bonifacio VIII lived from 1230-1303. Clearly tomatoes could not have been used in a recipe born in his lifetime, since they only made it over to Italian shores from the New World centuries later. 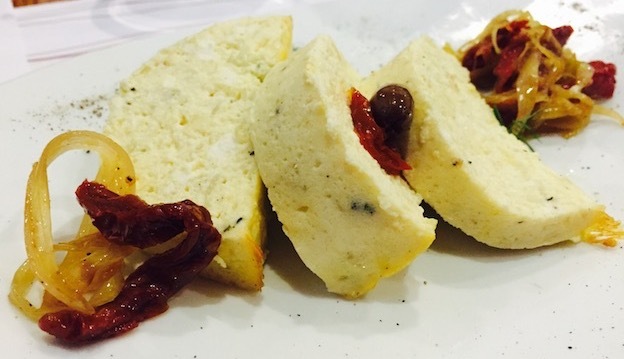 The cheese selection is worth a look, but desserts – not exactly a strong suit of Roman cuisine – tend to be on the heavy side. During my latest dinner at the Wine Bar, I indulged in the excellent gazpacho, which was cold, fresh and tasty, although not especially spicy (you can ask them to kick it up a notch) and the artisanal salumi selection, amongst which the outstanding salame mantovano was the best of the five or six different salumis on the plate). The selection of blue cheese is also a strong suit. I chose the international blues this time around, but the Italian selection of blues is even better). I drank very well this night out. The 2015 Bruna Pigato Riviera Ligure di Ponente Le Russeghine is a classic, a 100% Pigato made from mountain vineyards in Liguria’s Val Arroscia that is redolent of briny nuances complementing fresh citrus, rosemary aromas and flavors. Although it is reminiscent of Vermentino, Pigato is a different grape and wine (it’s a matter of biotypes), even if scientists insist Vermentino and Pigato are genetically identical. Then again, so are Pinot Blanc, Pinot Gris and Pinot Noir, and nobody thinks of those three wines or grapes as being the same. The 1985 Terlano Terlaner Riesling is absolutely lovely. Riesling, despite what you might think and what some less forthcoming producers might say now that the variety is very much “in”, was never a variety Alto Adige bothered with much (they didn’t want to compete with Austrian and German versions). 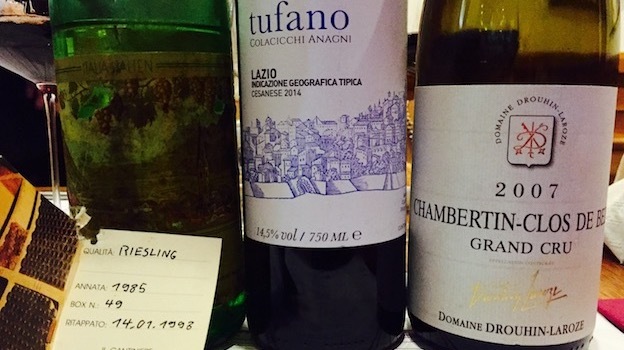 And so, rare older vintages were the efforts of a few dedicated men and women, none more than talented than the folks at Terlano, the cooperative that makes Italy’s longest lived white wines. This Riesling offers diesel fuel, white flowers and notes of honeyed lime in spades, if not quite the concentration of top European efforts. It has aged very gracefully and still has a long life ahead, and I am very grateful to have been able to drink another bottle after years of not seeing it anywhere. Another Ligurian beauty, this time red, graced my table and palate next; the 2014 Maccario-Dringenberg Rossese di Dolceacqua Luvaira is made from centenary vines located high up the mountains behind Imperia, in Liguria’s most western tip, close to France. The 2014 is much less herbal and offers sweeter red fruit than is normal for this variety, but it is a very enjoyable medium-bodied wine that matches heavenly with fish dishes in tomato sauce and with grilled white meats. Rossese di Dolceacqua is a little known Italian variety (not to be confused with Rossese di Campochiesa, altogether different and less qualitative) as well as the name of the wine. It can produce some of Italy’s most idiosyncratic light to medium bodied, saline reds. Moving right along to another little known Italian native grape, wine lovers should realize that one of Italy’s ten or so greatest grapes is the Cesanese d’Affile (another Cesanese, Cesanese Comune, is also good), and gives medium to full bodied wines that offer intense red cherry and sweet spice aromas and flavors with an unforgettable aromatic nuance in the very best examples. Unfortunately, it’s a variety that is neither easy in the vineyards nor in the cellars, and the winemaking talent level (or lack thereof) in Lazio is such that the variety’s great potential has long gone unnoticed. There are no such problems with the Trimani family, which has long run the Colacicchi estate, a historic Lazio winery that made some of the countries best red wines in the 1960s. The 2014 Colacicchi Lazio Cesanese Tufano is a 100% Cesanese Comune-Cesanese d’Affile wine that is magically perfumed and explosively fruity, with aromatic, sultry sour red cherry and mineral nuances that linger long on the aftertaste. Last but not least, the 2007 Drouhin-Laroze Chambertin-Clos de Bèze brings my evening to a perfect close: luscious, rich and ripe, but with the estate’s trademark elegant touch, it’s an especially refined red wine, from a producer that is currently off the radar of many wine lovers. Hence, the estate’s wines, even from important grand crus such as Chambertin Clos de Bèze, are more affordable than most.